In June of 1934, two prospectors, Cecil Main and Frank Carr, were using explosives to mine for gold in the San Pedro Mountains of Wyoming. After the dust of one of their blasts cleared, Main and Carr discovered a small room in a cave. There they found a tiny, mummified body with a deformed head, sitting in a flexed position. The mummy was about 6 inches long and weighed about a pound. From 1934-1950 the Pedro Mountain Mummy, as it was nicknamed, was sold a few times, as it made the rounds at sideshows and displayed in a drug store window in a glass jar. Ivan Goodman, a Casper, Wyoming car salesman, purchased it and used it in car advertisements. The Shoshone, a tribe indigenous to Wyoming, have many legends about “little people.” Goodman believed these legends and displayed the mummy as a pygmy man who was 65 years old when he died. Before the Pedro Mountain Mummy vanished around 1950, Goodman took the mummy to Dr. Harry Shapiro, curator of biological anthropology at the American Museum of Natural History in New York, where it was examined and x-rayed. Shortly after Goodman took the Pedro Mountain Mummy to the Big Apple it disappeared, and Goodman soon passed away. There are differing stories about what happened to the Pedro Mountain Mummy. Some people say Goodman lost it to a con man others say he sold it. In 1971, physical anthropologist Dr. George Gill was hired by the University of Wyoming when heard about the mummy from one of his students. He got the x-ray films from Shapiro and found that the mummy was not hoax, a pygmy, or an old man. These mummified remains belonged to an infant, maybe Native American, who suffered from anencephaly. Anencephaly is a neural tube defect and one of the most common skull abnormalities, characterized by the absence of a major part of the skull, brain, and scalp. As the skull develops, the cranial vault may remain open. If anencephalic births are alive, the infant generally dies within a week. Studies show that these disorder maybe hereditary, but taking folic acid greatly reduces the chances of the defect. The Pedro Mountain Mummy was featured in an episode of the 90’s television show, Unsolved Mysteries, which included an interview with Dr. Gill, who asked for the public’s help in locating the lost remains. 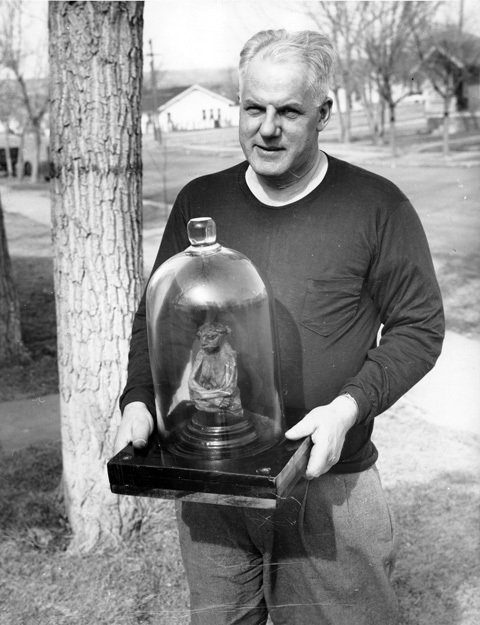 After the show aired, a Wyoming rancher brought Gill another mummy he found in 1929 in the San Pedro Mountain area. This second mummy was about four inches long and had blonde hair. Dr. Gill had this mummy X-rayed and tested. DNA and radiocarbon tests revealed that it was an infant who suffered from anencephaly and died in the eighteenth century. These results, Gill said, “confirmed everything that I had ever thought” about the Pedro Mountain Mummy, including the diagnosis of anencephaly. According to Atlas Obscura, Gill recently learned the mummy is somewhere safe, but is saying little else. I just saw a thing about this on Monumental Mysteries. I recognized the mummy as an infant with anencephaly, immediately, because I know a fair amount about such things. The term actually translates to “without a head”. It occurs at an incidence of 1 in 10,000, so not common, but I doubt that you could find an obstetrician who has never seen one. What I think is interesting is that more than one of these mummies has been found, but nothing is said about any other mummies of infants. There must have been some sort of significance about an an anencephalic to the culture they were born into, which led them to leave the bodies of such infants in a cave. I feel for the mothers of such infants, who would have had no way of knowing that there was anything wrong with their infants until birth.